Last year a friend offered to mule a few bottles from South Carolina if I had them shipped to his place, funny enough 2 of the three bottles he brought back contained whisky distilled in Canada (the other was a Crown Royal hand selected barrel). This bottle is a store selection, a single barrel at 56.7% abv for Third Base Market & Spirits. At this point it's public knowledge that the 10yr old Whistlepig whisky is 100% rye sourced from Alberta Distillers Limited, a powerhouse of a distillery that has over a million sleeping barrels of some of the best rye whisky. Sadly it's a whisky that we rarely see on our side of the border in anything but it's adulterated form (cut down to 40%abv or blended in the case of Dark Horse) or sold back to us by US firms under the guises of brands like Masterson's, Hochstader's & Whistlepig. This was the first time I was able to get a taste of ADL juice at cask strength (or nearly). Palate: Dry & sharp, floral & aromatic, there is a slight heat reminded you that this is almost 57% abv. Then it bursts with rye bread, a touch of cumin, apricots, candy apple & butter tarts. Full bodied, earthy and sweet salted caramel & cracked pepper, after the initial tickle there's very little burn on palate. The Blab: This is a great full bodied dram, more of a winter whisky than a fresh summery one. The bottle is in it's last third and It's lost some steam on the nose. It's a bit closed and lost some of it's initial peppery-ness and full throttle in your face rye. That said the palate has bloomed I don't remember getting as much dried fruits at first. This is really a sipper it takes time to discover and let everything come into play, it has a pleasant mineral waxiness that goes well with the sweetness, no dill notes either...so when do we bottle our own cask again? @cricklewood, thank you for sharing this well traveled whisky with us through your review. Yes, it is a well known fact that much of the WhistlePig juice comes from Alberta Distillers Ltd. of Calgary, Alberta. Some of their juice also comes from MGPI of Lawrenceburg, Indiana. WhistlePig Farms can no longer be called a Non Distilling Producer as they have laid down their own casks. They blend this aging rye spirit with whisky from both of the distilleries mentioned above and bottle it as Farm Stock. WP will soon have, if they don't already, aging distillate old enough to be called whisky. To the best of my knowledge WhistlePig 10 YO Straight Rye is bottled exclusively with Alberta Distillers Ltd rye. The tell tale sign for me is a distinct Juicy Fruit Gum note on the nose, MGPI whisky does not possess this note. You could also check the back label. The barrel proof version of WhistlePig 10 YO Straight Rye, although a product of Canada, is not easily found in its Country of Origin. Whenever possible I snap up a bottle or two of this extremely unique whisky. The price is generally found in the US$65 - $80 range. The price for a bottle of the standard 100 proof WhistlePig Straight Rye is $150.55 CDN. I can't imagine what the barrel proof version would cost in my region. For those of you crossing the border from the United States of America into Canada, keep in mind, WhistlePig 10 YO is not is not an American whiskey. It is not subject to the 10% tariff. Check the back label, it should contain the words Imported from Canada. Thank you both for expanding on this. WhistlePig is a distillery based in Vermont that, before they started making their own whisky, bottled 100% Canadian rye from Alberta Distillers. Otherwise, to be honest, I don't know much about WhistlePig. I vaguely remember tasting this at WhiskyFest in NYC a few years ago. This sample comes to me generously from @paddockjudge. The colour is a light coppery gold. Floral on the nose, with fresh raspberries, chili powder, wood smoke, cardamom and a very light shade of mint. Candied orange peel. Eucalyptus, Green apple. The fruit is in the background, behind the floral, herbal notes - but water tames that a little bit. Not bad but a bit too perfumed for me. On the palate, it's very, um, perfumey with more green apple, furniture polish, toasted oak and light honey. Rye spice and caraway are the dominant notes here, overpowering the more subtle fruity notes. Too much FWP though, that overpowers the palate, although water tames that overpowering, decadent flavour. The long, developing finish is quite fruity (berries, orange) with anise and pine. Although for me it is simply too strong and overpowering with the floral rye notes, I detect and appreciate the oak and fruity notes behind it. Water really helps but nevertheless it requires a bit more balance for me to really enjoy it. @talexander, "Too much FWP" reminds me of time well spent studying at l'Université Laurentienne. A few years ago, I was shocked to hear, on a local radio station, the claim that Vermont was producing a ten year old 100% Rye Whiskey! Now being a resident of the People's Republic of Vermont and somebody who tries to keep up with things alcoholic, I truly did a double take. Simple arithmetic told me that in order to have a ten year old rye, the distillation would have had to take place during the first few years of the new century. At that time, there was only one company authorized to distill in the state, Vermont Spirits located in St. Johnsbury, and their products were limited to vodka production - one made from whey (that's right, milk!) and one from maple syrup. These where pretty tasty products (especially the milk vodka) but were eons removed from anything remotely similar to whiskey. Curious, I examined a bottle at my local liquor store to discover that the bottle of rye in hand was "hand bottled at Whistlepig Farm, Shoreham, Vermont." Nothing else. Sourced whiskey was the likely ingredient, but from where? Lately, Whistlepig has come clean and admitted that they are sourcing their rye from Alberta Distillers in Calgary (why they would want to keep this a secret is a complete mystery, given the quality of the Canadian distillery's products)until they are able to sell their own rye (distillation is planned to start this year, 2015). Nose: Dry dusty rye spice along with soft fruit notes, a touch of licorice and vanilla. The nose is somewhat subdued after than initial rye arrival. Palate: Very firm on delivery, but for a 100 proof rye very smooth. Brown sugar and spices intermingle nicely then fade as vanilla and oak tannins make an appearance. Finish: Much shorter than you would think. Spice and wood tannins are the predominant elements, but fade quickly. Overall, a quality rye but one that is on the light side, especially for a 100 proof spirit. Some people have complained about the price ($75 in Vermont) but one must remember what you are purchasing: a 100 proof/100% rye from one of the premier Canadian distilleries. Even if it is a bit light I think the price justified. I've got WhistlePig in my glass now. Apparently they have their own distillery in the works but for now the brand imports all their stock. WhistlePig is currently made by Alberta Distillers, and then exported to the States where it gets bottled and deceptively labeled as an American product. This annoys some people, understandably. But I’m willing to overlook that little tidbit because I absolutely love this style. Yes, I enjoy a good Canadian whisky, but I’m a sucker for these big, ballsy ryes that are made to US specs. Best of both worlds here, I guess. Nose: Well, it’s rye alright. Clean and fresh. Pine, fresh cut grass, orange, anise, oak, caramel, toffee, spearmint and faint vanilla. Something floral pops up after a few minutes. This is an excellent and inviting nose. Palate: Light bodied. Quite a smooth arrival when considering the abv. Rye, grass, anise, menthol, butterscotch, cinnamon, and light honey. Finish: Long, herbal, and clean. White pepper burn ushers us into flavours of sharp rye, orange juice, mint leaves, hay, anise, clove, cinnamon, paprika, and charred oak. Thoughts: Excellent. I’m a sucker for strong rye flavours. Straight rye with a healthy abv is my kind of whisky. It’s got all the bite that a good rye should, but it remains balanced and drinkable. A bit pricey, yes, particularly when contrasted to my Willett’s ryes, which are cheaper and more full-flavoured. But overall it’s an excellent dram. Recommended. This whisky is somewhat notorious for trying to disguise both the source of its origin (Canada), and the fact that they don't actually distill any of their product (yet). If you go hunting on the label, on the back, in the corner, is a small little statement "imported from Canada". Dave Pickerell, the former master distiller at Maker's Mark, a well known whisky consultant who has a love for rye, is at the helm of the Whistlepig operation - and this product has been a huge success. The hope of the Whistlepig farm (in Vermont) is to do a complete seed to glass process, growing their own rye, distilling it, and aging it. This whisky is sourced from Alberta Distillers, like some other successful and excellent whiskies like Masterson's Rye. It is made from 100% rye, unmalted, - and, as the Alberta distillery does - this likely went in the barrel just short of 80% ABV, and came out likely above 80% before dilution. This shows the quality of the stuff that goes into the blends in Canada - typically a process with a "base" whisky which provides the bulk of the body and profile, and then this is "flavoured" with a stronger, perhaps spicier, whisky such as this one. Weighting the nose 25%, taste 35%, Finish 15%, and Intrigue 25% the overall grade is 89. They are pricey. But...WhistlePig Boss Hog 12 yo costs about the same in the US as a bottle of Uigeadail does in Ontario. Wouldn't you really like to drink some 67.3% abv Canadian whisky? Taste- Gripping with grapefruit, prickly spice, leather and cloves. Hints of sweetness, vanilla. Pine and dry. Finish – Long. Herbal and finish. Aromatic, peppery clove. Very Sorry you seem to have taken a lot of grief and personal attacks for your personal taste. Really a shame, I wonder if any of the mounted Whistle Pig brigade on here would have the courage to compare Serge to Donald Trump lovers for his low review. I seem to remember some of these same members complaining voraciously when others made political comments and attacks on here, requesting that we "keep the topic on whisky". I find it really inauthentic and extremely pompous that someone keen even try to defend his criticism of you for your subjective taste on whiskey when they have not even tried that whiskey. What are they referring to the opinions of others that respect more than yours. Really way out of hand! Geez, what a ridiculous fight! Isn't this a site for enthusiasm of whisky? @JJBriggs I can understand you feeling a bit set upon, given the timing of your review and the stir it's generated just recently. But that's not unusual. Things we do in the past can come back to bite us (look at that candidate who ran in Canada who was videotaped peeing in a cup in a kitchen (he was a plumber), rinsing, and placing the cup on the drying rack...). What I find amazing is the flow of the conversation is as if no time had passed from first review to last comment. Really fascinating. I look at reviews regularly and carefully to make purchasing decisions. If I were to read the review above, I would be left scratching my head. I agree with @JJ that you get to write what you want, but I also agree with @Nozinan. If I were the judge (and here I say anyone who wants to disregard my opinion go ahead), I would back Mr. @Levomepromazine's (didn't think I knew what nozinan is, didya? )argument that if you are writing for OTHERS to read, you should use words in the way MOST people would interpret them in proper words. For instance. "that's BAD!" - most people would think that means something is no good. But some people mean the opposite. I would suggest in a review forum most people would think Bad means BAD. So, Gripping is normally interpreted as a good thing, quintessential the same thing. That round goes to the Noz. JJ, you're right that everyone rates things differently. you're round...but wait! On this site 80 tends to be used for "don't buy it". It's unlikely someone would rate an 80 whisky as a 92. In my work it's really important that people communicating understand each other precisely, so they have to understand the same meaning for the terms they use. @Navs26, "Jim Murray" is my reply to celebrity scoring. Serge does his own thing and more power to him, but he is a scotch expert and does not necessarily have a taste for rye. Doesn't mean it's bad. And in terms of tone, sorry @JJ, yelling using CAPITAL LETTERS and using language I wouldn't tolerate from my kids does little to win an argument. I notice neither of the two you put in your sights for attack have bothered to reply to you. So I doubt you're right about them "needing" to have the last word. I suspect either you've convinced them, or more likely they've decided you're just not worth it. “Wow. What a nose!” ? When I first came across this heavenly Rye Whiskey I almost missed it. As I passed by the table, I was slightly distracted and then at the last moment I noticed this smiling pig with a top hat. I had heard good things,but wanted to form my own opinion. Boy, I am glad I stopped. “Wow. What a nose!” ? ??? ?I write this phrase more than once, because I said it more than once. I want to make this into a scented candle! I want it as my car freshener! ?? One of the main men behind WhistlePig is former Makers Mark master distiller David Pickerell. He is well respected in the whiskey world after his 14 years there, and WhistlePig is yet another feather in his cap. I love that this whiskey is not just a Rye…it is 100% Rye. That is pretty significant considering how tricky Rye can be to work with, and how most Rye whiskeys are actually only partially Rye to meet the 51% requirement…not 100%! Something else I like? The proof. Going at 50% ABV makes me a happy whiskey guy. I love being able to dictate the water content in my whiskey (which this needs nothing by the way). Finish: Even creamier as this goes on, with a slight hint of chocolate and oranges. This one is a stunner. To this date, I must say that it is one of the best Rye Whiskeys I have had. Worth noting that this juice is made in Canada and only bottled in Vermont. One of the joys of having Canadian friends that enjoy whisky is that you quickly figure out that Canada makes some of the best Rye whiskeys in world. It must be the extra years of aging and some magical Canadian yeast strains that help tame the pine cone characteristics that I tend to get in ryes. If I were a cocktail guy, I imagine this would make a great Manhattan, but alas, I will keep it nice and neat. Paired with nothing other than a glass. Man, that nose is absolutely fantastic. From a comparison perspective, the only other Rye that comes close to this nose , so far in my journey, is the High West Double Rye (also a high rye content option) but this one takes the aroma award. Once the sweetness fades a little and the cinnamon rye spicy kick pops in, I am in some type of nutmeg heaven. Worth seeking out. Made by David Pickerell, who served as the master distiller at Maker's Mark for more than a decade. This rye is for big flavor hunters. The first sip lets you know that it is brimming with vanilla, orange peel and other baking spices. The strangest thing I find each time I revisit this bottle is an ever-present note of arugula.This is a big, mouth-coating rye that finishes long and creamy, but never loses the kick of the rye itself. It is a very distinctive, probably polarizing whiskey. 100% Rye, 100 proof, 10 Year. @talexander, yes, Masterson's 10 yo Rye is definitely fuller and richer, than is WhistlePig. Although the WhistlePig packaging bears all of the hallmarks of an American whiskey—the prototypically American spelling of “whiskey” gracing its the label; it is labelled as a straight rye, which by US standards implies at least 51% rye grain in the mash bill and that it is aged in charred, new oak; and it claims to originate from a farm in Vermont—it is a Canadian whisky. Dave Pickerell, former Master Distiller at Maker’s Mark and now currently Master Distiller at WhistlePig Farm, sourced 100% rye whisky aged 10 years from a Canadian distiller to bottle as WhistlePig 10 year-old Straight Rye Whiskey. The whisky is likely the “flavouring” whisky used by Alberta Distillers in their Alberta Premium Canadian whisky—the only Canadian whisky distilled from a 100% rye mash bill that has been aged for at least 10 years (Alberta Premium comes in a 25 year-old expression). The nose is instantly expressive, with lots of buckwheat pancake sweetness, nutmeg, and brown sugar. It is also quite grassy. There are hints of banana, toffee, black tea, pecans, mint, and honey. It positively stuffs your nose with delightful scents. The palate is slightly dry, with touches of grass and apricots. The finish is beautifully long, warm, and honeyed. 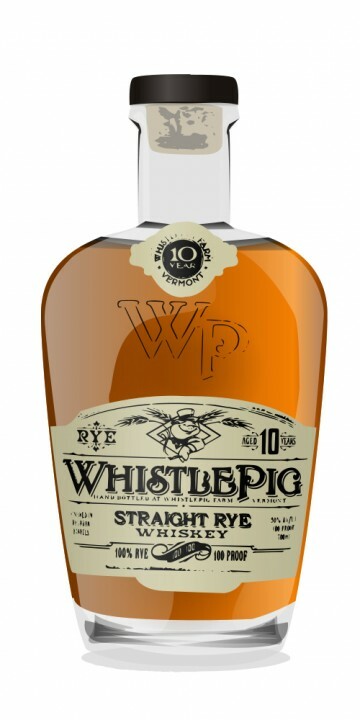 WhistlePig 10 year-old Straight Rye Whiskey is not a flawless dram—as much as the Rittenhouse was perhaps too corn heavy for a rye, WhistlePig could use at least a touch of corn in the mash bill for balance—but it is nonetheless a very good one. It is wonderfully flavourful, and reflects the quality of good flavouring whisky. I hope WhistlePig Farm, when it is up and running, eventually manages to produce a whiskey of such quality of its own. Another fine review @DBK. I have yet to open up my bottle of WhistlePig but looking forward to it. From your description, this might be a whiskey to use for vatting experiments...maybe a few drops into a heavily influenced corn mash bourbon?